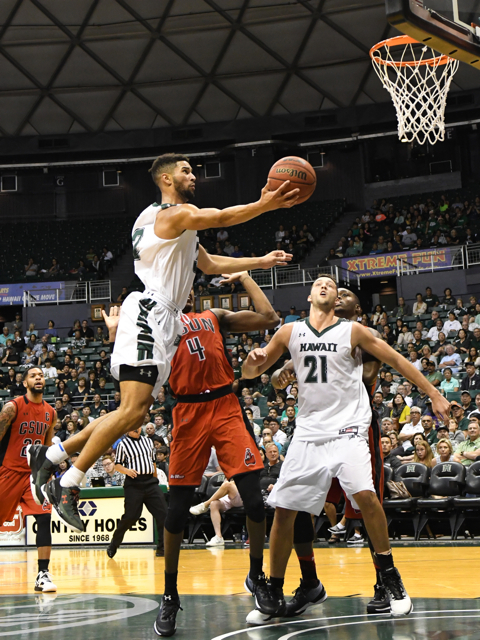 While a trilogy of fantastic finishes would be great, the University of Hawai’i basketball team will take a win in any form when it hosts UC Davis on Saturday night at the Stan Sheriff Center. The Warriors are 8-9 overall and 2-2 in the Big West Conference. 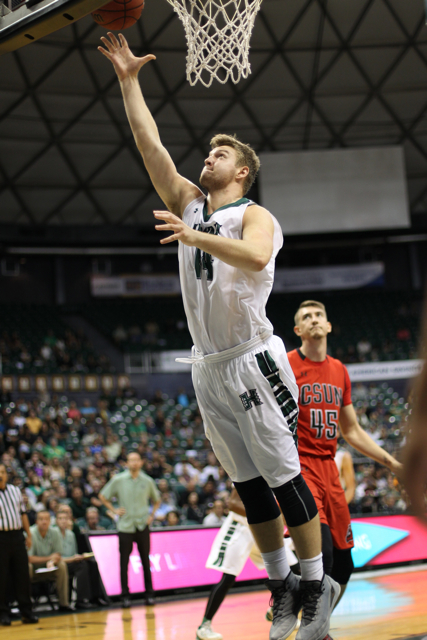 A win on Saturday would result in Hawai’i’s first three-game winning streak of this season. More importantly, it could vault the Warriors as high as second place in the conference standings. The Aggies are 11-8 overall and 3-1 in the Big West. Saturday’s game is scheduled to start at 7:00 p.m., and it will be televised in Hawai’i on OCSports (Oceanic channels 16 and 1016). The Warriors are coming off back-to-back thrilling wins – a 114-107 overtime victory over Long Beach State on January 14, then a buzzer-beating 80-77 triumph over CSUN on Wednesday. Senior forward Noah Allen has been the catalyst for the recent run of success. He scored a then-career high 25 points against Long Beach, then established new career-highs of 30 points and 12 rebounds against CSUN. He leads the Warriors in scoring (12.4) and rebounding (5.4), and is also contributing 2.1 assists per game, and leads the team with 21 steals. Freshman guard Leland Green, who hit the buzzer-beating 3-pointer to beat CSUN, is averaging 12.0 points and 5.5 rebounds per game since being reinserted into the starting lineup for the past six games. Sophomore forward Jack Purchase is averaging 10.8 points and 4.1 rebounds per game, and ranks third in the Big West with 42 3-pointers. Junior forward/center Gibson Johnson is averaging 10.4 points and 4.8 rebounds per game. Sophomore point guard Brocke Stepteau is averaging 7.9 points and a team-high 2.9 assists per game. The duo of 6-8 Purchase and 6-8 Johnson will be in an intriguing matchup against UCD’s post duo of 6-6 Chima Moneke and 6-7 J.T. Adenrele. Moneke and Adenrele are both considered “inside” players (neither has even attempted a 3-pointer this season), but one of them will likely have to defend Purchase – and vice versa. Moneke is a junior in his first season of action with the Aggies, but is already emerging as a contender for Big West Player of the Year. He is averaging a team-high 14.7 points per game with a .575 field goal percentage, and leads Big West with 8.3 rebounds per game and 21 blocked shots. He already has seven double-doubles this season. Moneke, who is originally from Australia, played two seasons at Northeast Community College (Nebraska), then redshirted the 2015-16 season at UC Davis. Adenrele, a senior who missed all of last season with a knee injury, is contributing 5.8 points and 5.2 rebounds per game. Brynton Lemar, a 6-4 senior guard, is averaging 13.8 points, 3.2 rebounds and 2.9 assists per game, and leads the team with 36 3-pointers. He averaged 13.5 points and 3.0 rebounds in two losses to Hawai’i last season. Siler Schneider, a 6-3 sophomore who is usually the first guard off the bench, is contributing 10.4 points per game and is second on the team with 25 3-pointers. He averaged 10.0 points and 4.0 rebounds in two losses to Hawai’i last season. Darius Graham, a 5-10 senior point guard, is averaging 7.5 points and 3.7 assists per game; Lawrence White, a 6-4 senior guard, is averaging 7.1 points and 3.7 rebounds per game. The Aggies won the Big West regular-season title in 2015, but struggled with injuries and newcomers last season en route to an 11-19 record (6-10 Big West). Nine players are back this season, and they have already matched last season’s overall win total, and are currently in second place in the Big West. UCD’s only conference blemish so far is a 61-55 road loss at UC Riverside. 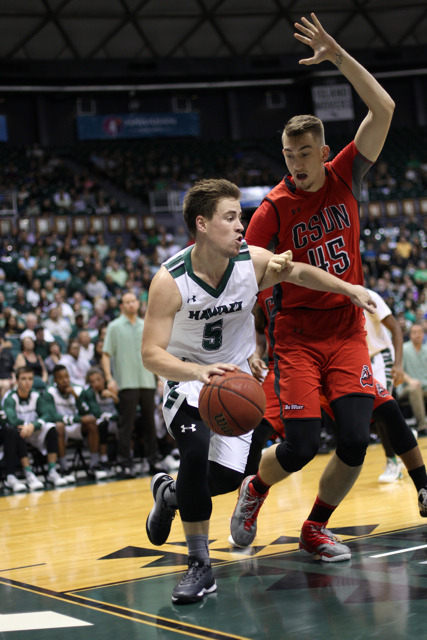 Interestingly enough, both Hawai’i and UCD enter this game off three-point victories over CSUN. The Aggies topped the Matadors, 71-68, at Northridge, Calif., on January 14, and have not played since. That means they had a week to prepare for the Warriors, who beat CSUN, 80-77, on January 18. TICKETS: Lower level – $30 for all seats; Upper level – $18-$20 for adults, $16-$18 for senior citizens, $5-$7 for youths (ages 4-high school). Free for UH-Manoa students with validated identification. Parking is $6. THEME: “Superhero Night” – fans are encouraged to wear superhero apparel. UC Davis at Hawai’i, 7:00 p.m.
Another tough test tonight. Everyone needs to come show up and support our Warriors. They Believe.